We are returning to the WESTIN SAINT FRANCIS HOTEL (just across Union Square from our regular meeting location) for this year's very special Holiday Party and Annual Meeting: This year we will celebrate our Club's 110th anniversary in the exact same room where our Club held its very first meeting on Tuesday, November 12, 1908! 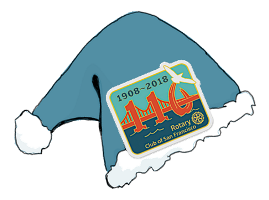 Don't miss great Rotary holiday cheer as we share a toast, enjoy musical performances by members and friends, win raffle prizes, and sing holiday songs. This is always the most festive and fun-filled luncheon of the year, so bring your family, friends, and business associates to celebrate with us! It's important for members to attend so we have a quorum for the brief Annual Meeting, where we will elect new Board members and confirm Casey Blair as our next Club President. Please bring an unwrapped toy for the Firemen’s Toy Drive. Suggested items are ethnic dolls, sports equipment, and gift cards. The reception begins at 11:00 AM, with the main program beginning at 12 noon. Tickets are no longer available. We cannot guarantee space for walk-ins. Tickets are $75 through December 6. On December 7, the price goes up to $99 with only the chicken menu option available, so buy your tickets now! Tables are no longer available. Sponsorships are no longer available.